PANAMA CITY, Fla. - When someone feels chest pain, dizziness, or other symptoms, they're likely having an immediate issue with their heart. A heart attack and cardiac arrest are sometimes confused to be the same thing. News 13's Alex Thorson tells us the large, important differences in this week's Health Desk report, sponsored by Bay Medical Sacred Heart. Both can happen to any one at any age; to men or women, and even produce similar symptoms. How they function, however, couldn't be more different. "A heart attack is a plumbing problem and cardiac arrest is an electrical problem," Dr. Joe Trantham, an interventional cardiologist, said. 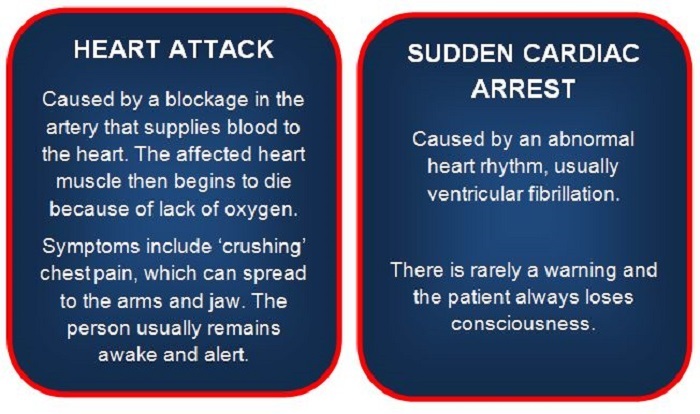 A heart attack is when blood flow to the heart is blocked, and cardiac arrest is when the heart malfunctions and suddenly stops beating unexpectedly. "Cardiac arrest can occur as part of a heart attack, but also can occur as an independent event unrelated to a heart attack," Trantham said. If one is suffering from a cardiac arrest, "the first symptom is the lights go out and you collapse to the floor," he said. "The key is to shock the heart back to normal rhythm," he said. An AED, or automatic external defibrillator, can be found in most public places and will deliver that shock. "We're talking seconds, or minutes at most. The longer it takes, the less chance of survival," Trantham said. If you don't have one, call 9-11 and perform CPR. A heart attack comes with a separate set of symptoms: Chest pain, shortness of breath, break out in sweat, nauseated, vomiting, and more. If someone thinks they're having a heart attack, call 9-11 immediately, and take a pain reliever like aspirin. Next week, we'll look at how surgeons respond to STEMI's the most severe type of heart attack.